If you would like to attend this event, please apply to Tim Minton (t.minton[at]camford[dot]org) by Friday, December 13th. Members are welcome to invite one guest each. Payment is required in advance; account details and directions to IHJ will be sent to those who apply to attend. 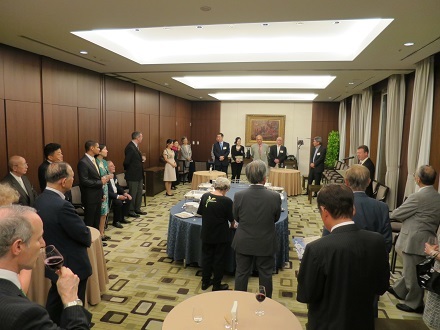 Berry Bros. & Rudd will kindly host another wine-tasting event for us at their offices in Marunouchi. Space is limited, so this event is open to C&O members only. If you would like to attend, please contact Tim Minton (t.minton[at]camford[dot]org) by November 21st. Payment is required in advance. Account details and directions to the venue will be sent to those who sign up. This event will be attended by the Headmaster of the Leys School Cambridge, Mark Slater (St Edmund Hall Oxford), who has kindly agreed to give us an after-dinner talk on the role the school played in educating the Meiji Japanese who founded the Cambridge Society in Tokyo, which later became C&O. Payment is required in advance; account details and directions to The Tokyo Club will be sent to those who apply to attend. No refunds for no-shows or those who cancel after the closing date (Oct. 27). If you would like to attend this event, please contact Tim Minton (t.minton[at]camford[dot]org) by October 27. Our main July event is a Summer Buffet on Friday, 5th July at Tsunamachi Mitsui Club (www.tsunamachimitsuiclub.co.jp/), a private club for senior members of the Mitsui Group, which is housed in a spectacular 1913 mansion designed by British architect Josiah Conder (1852 – 1920). It was originally built as the Mitsui family’s guesthouse. This will be our second visit to the Club. 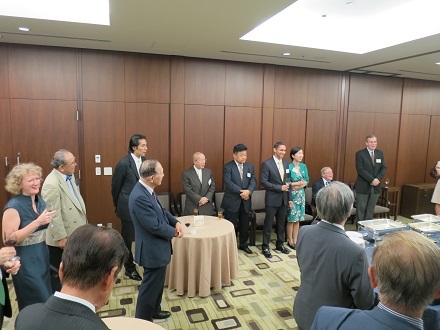 The first was last September, when we held a farewell party there for Sir David and Lady Warren. If you would like to attend this event, please let Tim Minton know by Tuesday, 2nd July (t.minton[at]camford[dot]org). Our main June event will be held at Kojunsha, a private club founded in 1880 by Yukichi Fukuzawa, who also founded Keio University. This is a new venue for C&O, and we hope that many members will take the opportunity to experience the Club’s exclusive atmosphere and excellent food. Mr Yuhiko Yasunaga (Wolfson Cambridge 1990) has kindly booked the Chu-Shokudo for the event. Kojunsha is located in Ginza 6-chome; directions will be sent to those who sign up. Members are welcome to invite one guest each (more than one in the case of family members). If you would like to attend this event, please contact Tim Minton by Tuesday, June 18th (t.minton[at]camford[dot]org). Payment is required in advance; the Society’s bank account details will be sent to those who apply; those who cancel after the deadline [17th May] will be charged the full attendance fee. Our main April event is a Buffet Dinner in the Continental Dining Room, Ark Hills Club in honour of former C&O member The Right Honourable The Lord Mayor of London Alderman Roger Gifford (Trinity, Oxford). If you would like to attend this event, please contact Tim Minton (t.minton[at]camford[dot]org) by April 1st. Members may invite one guest each (up to two in the case of family members). Detailed directions to the Club will be sent to those who apply to attend.